Aamir Khan’s “Satyameva Jayate” has for sure been the talk of the town since the first episode aired last week. The show obviously has the heart in the right place. Aamir Khan’s show is just trying to create awareness and nothing more than that. There have been various shows in the past on the same lines but this is the first one with a premier star hosting it. Vijay TV (Star TV’s Tamil network) had a similar program with actress Lakshmi at the helm. It had the same concept but obviously not as high profile as Satyameva Jayate. First things first we need to appreciate Aamir for taking such a show to venture into television. At least he has the intention to take the already known problems to the living rooms of the people. At least this will get the people thinking. There have been lots of articles online about the show and there have been criticisms. The criticisms are unwarranted as this is a TV show with a social message. Take what you can from the show and if possible change the way you look at the issue or else just consider it as an awareness show. Don’t expect Aamir Khan to be the messiah to save people from their troubles. No TV show or movie can accomplish that. It always lies in the hands of the individuals. This is the problem with the Indian society, we are extremely defensive. If someone points out an issue in the society we will not believe and if someone points that out with the statistic we expect them to do more than that. It is always someone who has to change things. Life is not a movie where a hero will come in and abolish all the social evils that exist. The TV show is supposed to make people aware and since it is hosted by a celebrity it will grab the attention of the big leaders too which might actually help the people affected. The message will also reach the masses as at least they will watch this to see their star Aamir Khan hosting it. It is a known fact that India only listens to celebrities. The two journalists who took so much risk in exposing the doctors running these centers did not receive any help from the government. This is absolute appalling and the fact that they are made to run around to different courts in Rajasthan is even more ridiculous. As soon as “Satyameva Jayate” aired on TV Rajasthan chief minister took action on the sonography clinics, shows how even the politicians listen only to movie stars. But we can be happy that something came out of the show. The only thing I would say that female feticide is a serious issue in India and Satyameva Jayate has just brought it to light and obviously the seriousness of the issue. There are many other social issues which need to be tackled in our country and these sorts of shows are the need of the hour. Instead of criticizing the show I would be happy if the people try embracing such shows by trying to bring some change in the society. We don’t need to question the intention of the show but just look at the good things the show might do. It is like this when some celebrity or a millionaire does some charity we don’t appreciate them because we think that it is done to save on taxes, but we need to think that at least they did charity and the money went to some good cause. How many of us will even do that? We think that life around us is rosy and nothing is wrong with the society around us. There is no need to get defensive about our country. Unless we embrace the issues we cannot eradicate them. The country grows and improves only if the issues are tackled. India as a country for ages has always ignored the serious issues and we always want to live in a fantasy land. If we see a video of child labor in India we cry and then complain why that video is even put online instead of thinking of ways to help those children in some way. We only think why someone posted that video to disrupt our great, smooth life. We don’t want to even think about issues faced by others nor do we want to help anyone. The only thing we can do is write some articles to criticize someone who is at least doing something. He might not eradicate female feticide, Child labor or various other issues in India but at least he is trying to educate people. Satyameva Jayate is a show which is the need of the hour. Take the show for what it is. Try to think that the show is to educate people rather than a one which is started to make sweeping changes. There cannot be a Robin Hood who will come in and eradicate all the problems and especially a TV show which will never accomplish that. I like the show and I think it deserves all the accolades it is getting and definitely does not deserve the criticism. I would like to ask all the writers who have questioned the intention or the effect of the show as to what they have done to tackle the social issues in India, have they even written about it before the show was aired? Think about it and you will get the answer. As of now Aamir has done as great job with the first episode and I hope that he continues to tackle more such issues and people living in defensive mindset realize life isn’t as rosy as they think. This is not a movie, this shows real life and real people and we need to realize that these people are around us. 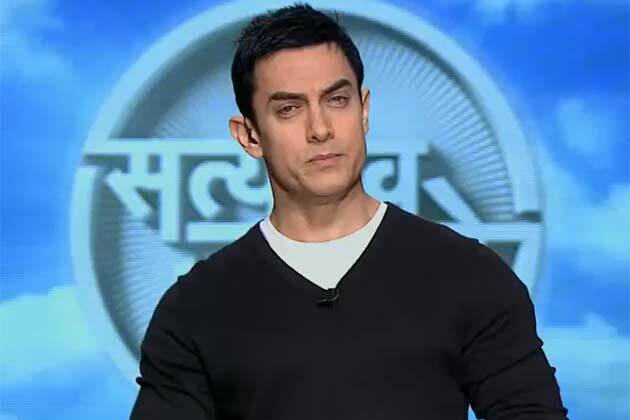 I had a chance to watch one episode on the female child abortionI(Satyamevjayate) and I feel that Amir Khan is doing an exceptional job creating awareness amongst the masses. I hope that people will wake up before it is too late. Yup, that’s exactly what we need to take this show as. There cannot be any sweeping changes in the society by a TV show. People need to wake up to the problems around and face it head on, instead of blaming Aamir for not doing enough. respected Aamir sir hello sir this is monal gargote . i would also like to tell you how my dad and the whole paternal side has trobled me ,my mother and my sister. sir i am now in final year of my bpharma . these people have not even helped my mother even once for paying fees or not even bothered to turn back to ask our basic needs. we (me ,my mother and my yonger sister is staying with my nana – nani (maternals) since my birth. my mother takes only tutions earn our living . i wanna talk to you in detail there’s lot to tell you sir please give me the details where i can contact you .actually i would like to say sorry if i have contacted you in wrong place. also would like to tell u when we asked help from law ,it failed to help us . please help me with your contact details.please please sir please.. This site isn’t owned by Aamir Khan. Please post your concern in http://www.satyamevajayate.in .